1 COUNTERBALANCE VALVES Introduction They are modulating valves which allow free flow into the actuator and then block the reverse flow until they feel a pilot pressure inversely proportional to the load in the pilot line. They employ a check valve for the free flow direction, a relief valve to control the flow in the reverse direction and a pilot piston which lowers the relief valve setting. They can lock loads in a leak free mode and they are well suited for many clamping applications or to prevent negative loads from falling down in case of hose failure. For load lowering, they improve motion control in most systems because they compel the directional control valve to always meter positive pressure, also under overrunning load conditions. Counterbalance valves can be used with paired cylinders: pilot pressure will open first the valve of the most heavily loaded cylinder; this will cause load transfer to the other cylinder and the related valve, still closed, will require less pilot pressure for opening. For best safety, they should be fitted close to the actuator, either flange mounted or connected through metallic pipe. Single acting counterbalance valve Dual acting counterbalance valve Functions of counterbalance valve modules A Free upstream flow through the check valve for load lifting. B Locking of reverse downstream flow when the directional valve is not operated, or the pump is stopped. 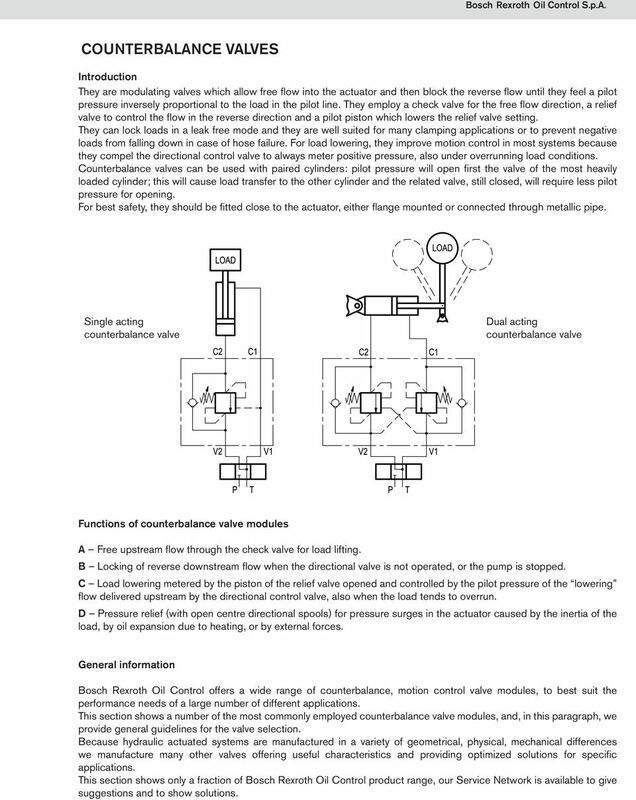 C Load lowering metered by the piston of the relief valve opened and controlled by the pilot pressure of the lowering flow delivered upstream by the directional control valve, also when the load tends to overrun. D Pressure relief (with open centre directional spools) for pressure surges in the actuator caused by the inertia of the load, by oil expansion due to heating, or by external forces. General information Bosch Rexroth Oil Control offers a wide range of counterbalance, motion control valve modules, to best suit the performance needs of a large number of different applications. 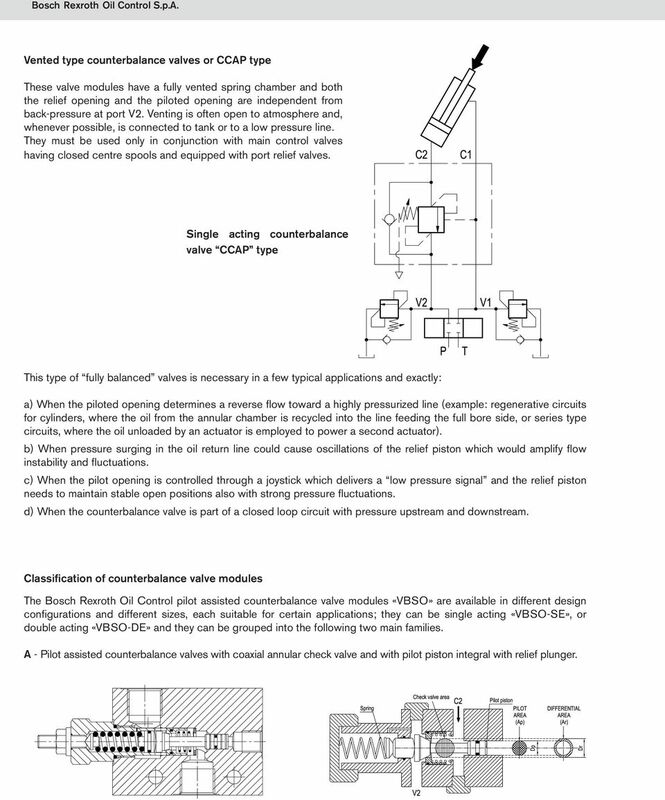 This section shows a number of the most commonly employed counterbalance valve modules, and, in this paragraph, we provide general guidelines for the valve selection. Because hydraulic actuated systems are manufactured in a variety of geometrical, physical, mechanical differences we manufacture many other valves offering useful characteristics and providing optimized solutions for specific applications. This section shows only a fraction of Bosch Rexroth Oil Control product range, our Service Network is available to give suggestions and to show solutions. 4 Vented type counterbalance valves or CCAP type These valve modules have a fully vented spring chamber and both the relief opening and the piloted opening are independent from back-pressure at port V2. Venting is often open to atmosphere and, whenever possible, is connected to tank or to a low pressure line. They must be used only in conjunction with main control valves having closed centre spools and equipped with port relief valves. 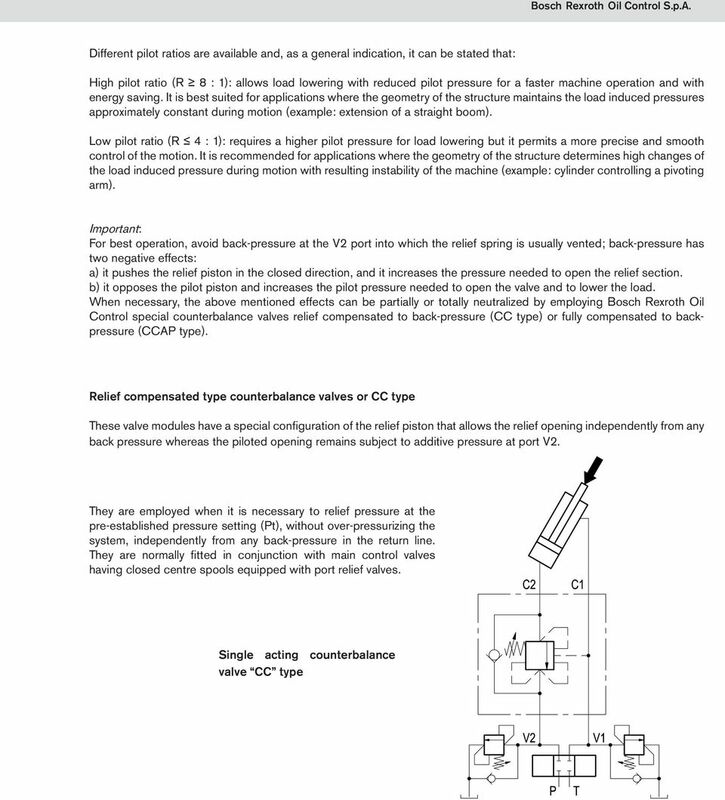 Single acting counterbalance valve CCAP type This type of fully balanced valves is necessary in a few typical applications and exactly: a) When the piloted opening determines a reverse flow toward a highly pressurized line (example: regenerative circuits for cylinders, where the oil from the annular chamber is recycled into the line feeding the full bore side, or series type circuits, where the oil unloaded by an actuator is employed to power a second actuator). b) When pressure surging in the oil return line could cause oscillations of the relief piston which would amplify flow instability and fluctuations. c) When the pilot opening is controlled through a joystick which delivers a low pressure signal and the relief piston needs to maintain stable open positions also with strong pressure fluctuations. d) When the counterbalance valve is part of a closed loop circuit with pressure upstream and downstream. Classification of counterbalance valve modules The Bosch Rexroth Oil Control pilot assisted counterbalance valve modules «VBSO» are available in different design configurations and different sizes, each suitable for certain applications; they can be single acting «VBSO-SE», or double acting «VBSO-DE» and they can be grouped into the following two main families. A - Pilot assisted counterbalance valves with coaxial annular check valve and with pilot piston integral with relief plunger. 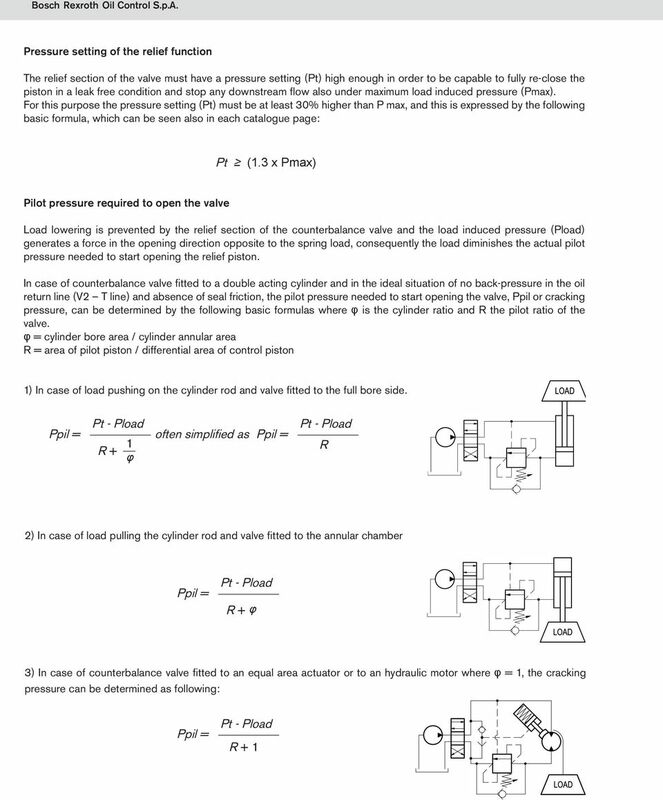 6 Dampening of the pilot piston, for stable pilot opening and smooth load lowering The operation of a counterbalance valve while controlling load lowering is affected by many variables among which the input of the operator, the opening areas of the directional valve, the load induced pressure, the viscosity of the fluid, etc., and, most of all, the fluctuations of the pilot signal. Insufficient dampening of counterbalance valves is often the cause for undesired oscillations; Bosch Rexroth Oil Control has developed counterbalance valve modules with a variety of special devices in order to achieve a more controllable and stable pilot function for better load lowering. Here are the most commonly used. 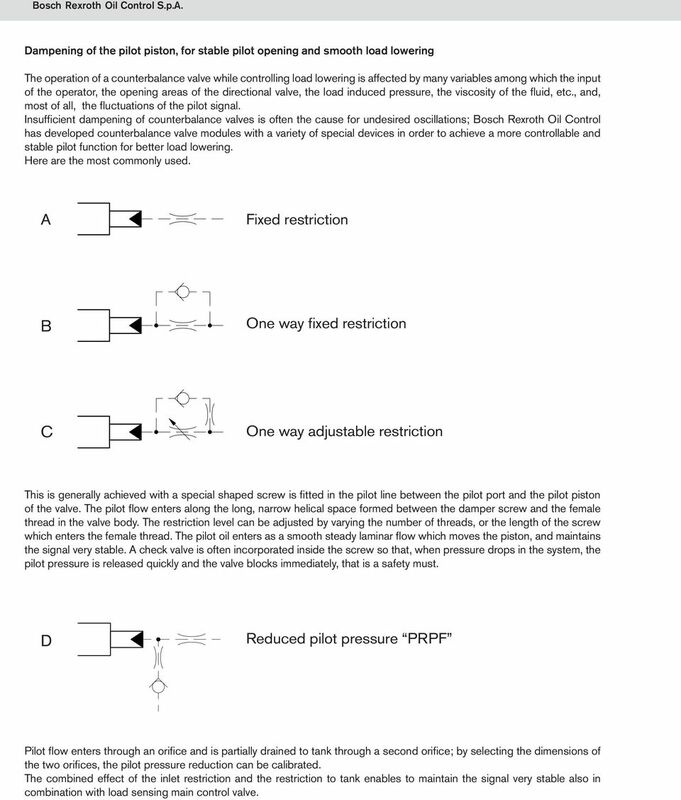 A Fixed restriction B One way fixed restriction C One way adjustable restriction This is generally achieved with a special shaped screw is fitted in the pilot line between the pilot port and the pilot piston of the valve. The pilot flow enters along the long, narrow helical space formed between the damper screw and the female thread in the valve body. The restriction level can be adjusted by varying the number of threads, or the length of the screw which enters the female thread. The pilot oil enters as a smooth steady laminar flow which moves the piston, and maintains the signal very stable. A check valve is often incorporated inside the screw so that, when pressure drops in the system, the pilot pressure is released quickly and the valve blocks immediately, that is a safety must. D Reduced pilot pressure PRPF Pilot flow enters through an orifice and is partially drained to tank through a second orifice; by selecting the dimensions of the two orifices, the pilot pressure reduction can be calibrated. The combined effect of the inlet restriction and the restriction to tank enables to maintain the signal very stable also in combination with load sensing main control valve. 7 The above arrangements are very effective for pilot dampening but are sensitive to viscosity; changes in oil temperature can produce variations in response time, independent from the operator s input. The target of the latest developments has been to design dampening devices which combine both sufficient dampening good responsiveness. To overcome the delay problem, a small normally open by-pass (VEM) has been added in parallel with the damper screw. 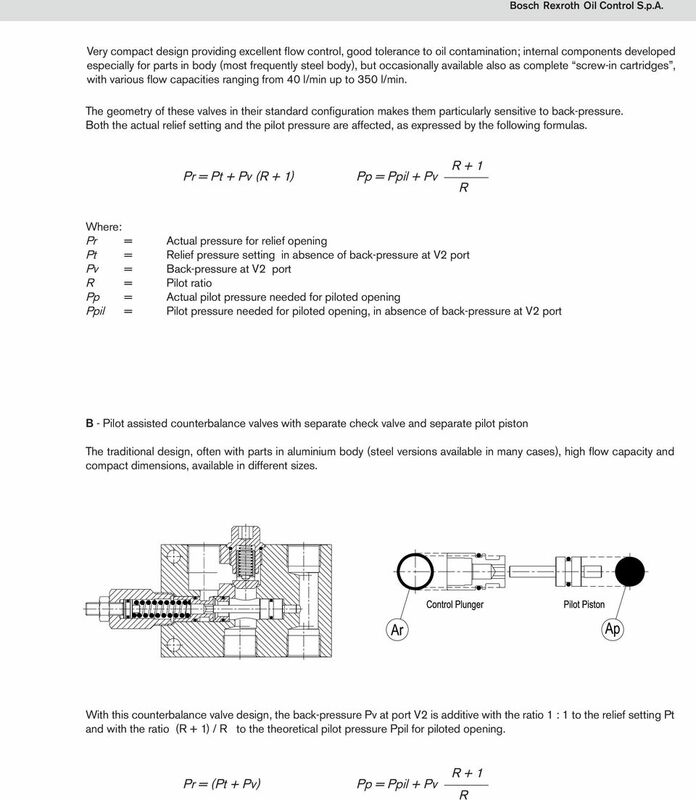 The VEM closes and quickly locks any further flow inlet when the pressure setting is reached (see scheme). When the lowering is started slowly by the operator, the pilot oil enters immediately the pilot chamber and pressurizes it up to almost cracking point; only the final pressurization is achieved through the dampening screw, and this happens quickly without delay. 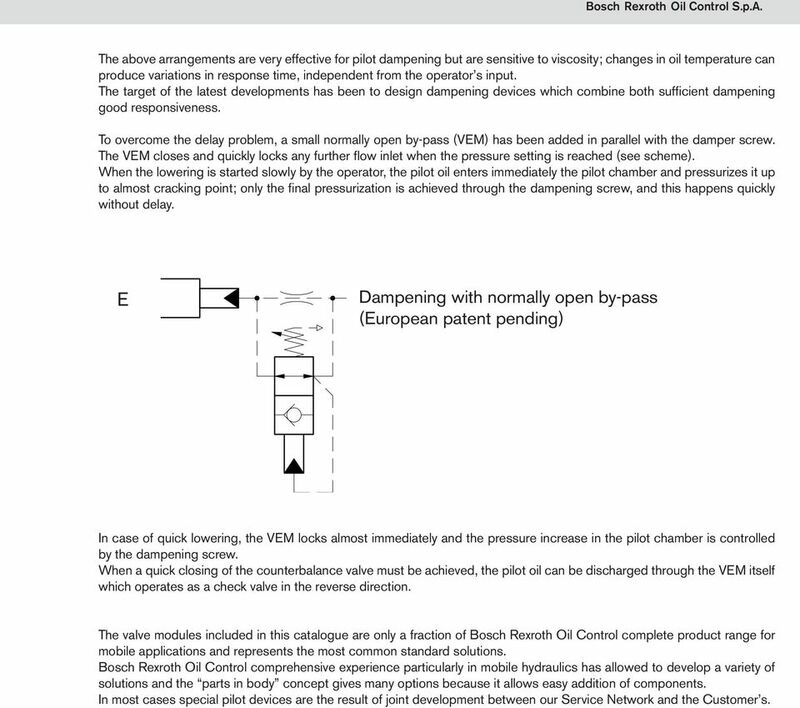 E Dampening with normally open by-pass (European patent pending) In case of quick lowering, the VEM locks almost immediately and the pressure increase in the pilot chamber is controlled by the dampening screw. When a quick closing of the counterbalance valve must be achieved, the pilot oil can be discharged through the VEM itself which operates as a check valve in the reverse direction. The valve modules included in this catalogue are only a fraction of Bosch Rexroth Oil Control complete product range for mobile applications and represents the most common standard solutions. Bosch Rexroth Oil Control comprehensive experience particularly in mobile hydraulics has allowed to develop a variety of solutions and the parts in body concept gives many options because it allows easy addition of components. In most cases special pilot devices are the result of joint development between our Service Network and the Customer s.
NE at a glance Company, product index Company profile NE, founded in 995, is a valve manufacturer specialising in the development of hydraulic solutions for mobile, agricultural and industrial applications. hance the application of specific components, such as pumps, motors, accumulators, filters, and airline lubricators.